A simple cake.......all about presentation and getting the kids involved and a HAPPY FOURTH OF JULY!!!!! 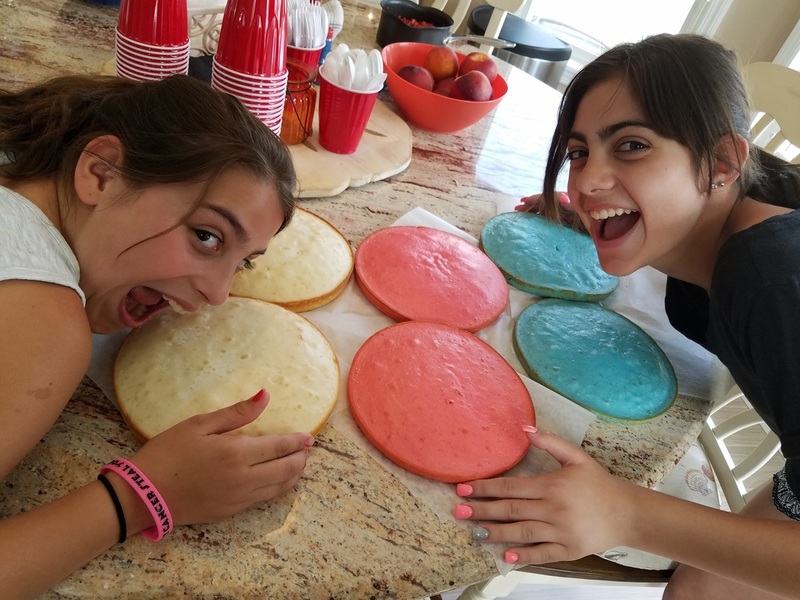 Again, the Junior Chefs... Angelina and Natalie, put their heads together....and this was their result!!! Is it not gorgeous??? 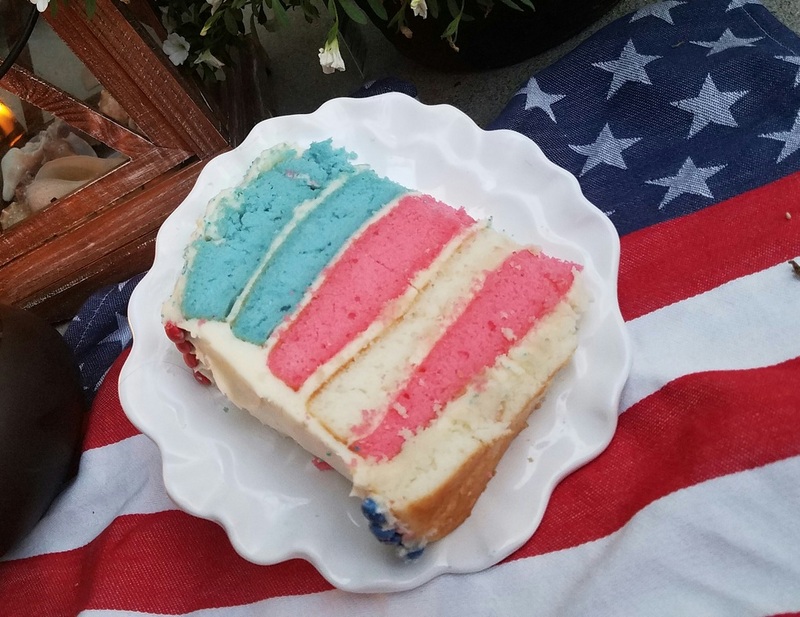 What a creation....and what a presentation this cake will make when you cut into it and pull out the first slice at your July 4th celebration. With not much guidance at all they did a fantastic job....I am soooo proud of these girls. Great job girls!!! Soooooo simple!!! In a very large mixing bowl prepare all three cake mixes together as directed on package. 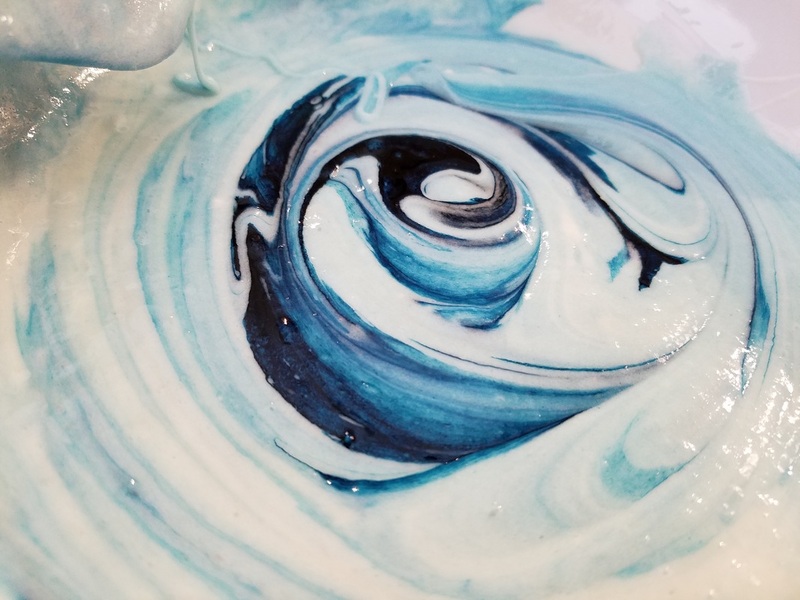 I used the egg white version as directed on the back so the batter would be as white as possible and get great color when we add the red and blue. Now grab two more smaller bowl and divide the batter into the three bowl. It does not have to be exact but try to get them as close as possible. 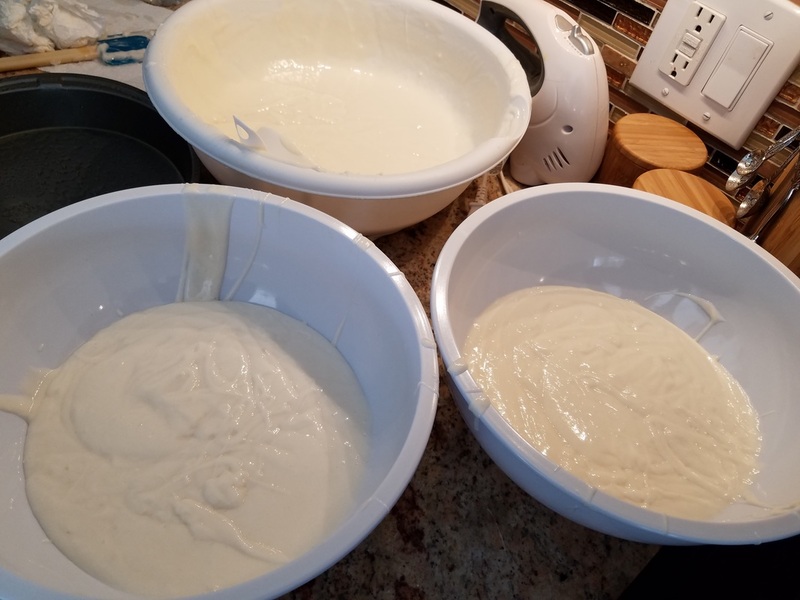 We used a one cup measuring cup to transfer batter to the other bowls to get an idea of how much we had in each and tried to keep it as close as possible. Angelina may have added one too many by the looks of this.....haha!! Now add some red food coloring to one bowl.....and blue to the other. Start out with about 10- 12 drops but add as much or little to get it to the color you are happy with. Mix in slowly with a spatula until you get there. Pour into prepared pans....You can bake one color at a time dividing the batter into two pans. If you have four pans.....go for it!! But each color will be divided into two pans so we will end up with 6 layers in the end!! While they cool off....let's get going on the frosting!! So, you can never go wrong with a cream cheese frosting...everyone loves this frosting. I did choose this frosting for a bigger reason with this cake. It is a very thick and dense frosting. And with 6 layers....you need a frosting that will hold it together like glue so it doesn't topple over when you get to the top!! If you make it thick enough you could probably use it as spackle!! Start with the softened cream cheese and butter in a mixing bowl. Cream together....add the vanilla. Last slowly...work in small additions to add in the powdered sugar. Incorporating all before each addition until it come to a SPACKLE consistency!! ​Of course....you have to taste test as you go along.....the kids got that down!!! Next we get to layer!!!! We choose to do white, red, white, red...then blue and blue. We though it represented the flags colors nicely but feel free to do any combination of colors you like. There are two tricks to making a nice sturdy and even cake like this. The first is to use a very small amount of frosting in between each layer. If it is too much the cake may slide easily. 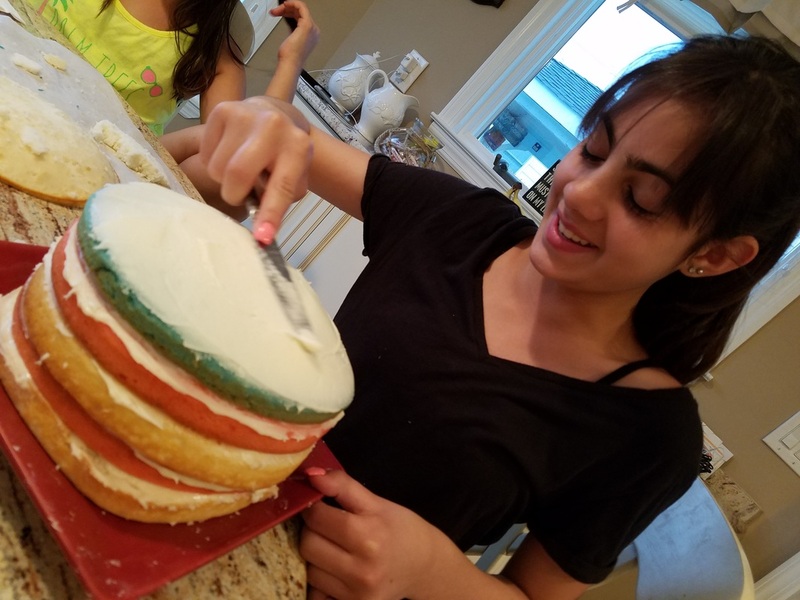 The second is....if you need to level your layers, use a long sharp knife, level the cake but then turn it over to use the bottom side to frost. It will be way to difficult to frost the fresh cut side of the cake. And no one will know the difference!! It's like a tower, I know. 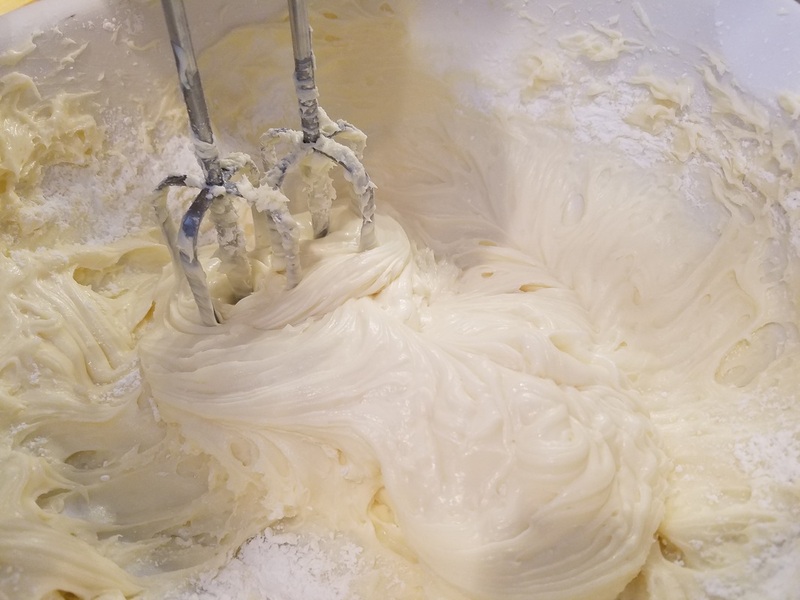 If it is leaning you can straighten it out with your hands and flatten and press each layer before frosting with your hands to kind of squish together firmly. 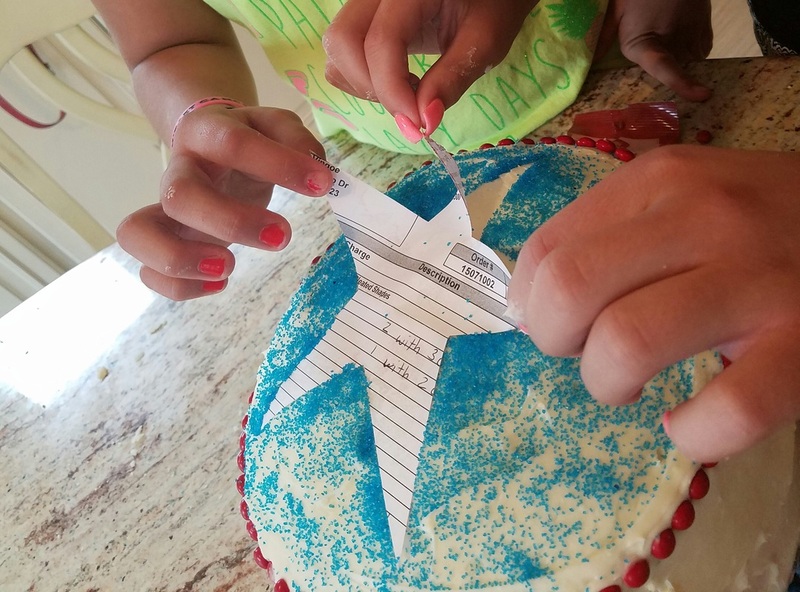 The girls decided they wanted a blue star on top....so we simply cut out a star shape out of a piece of paper. Then we sprinkled the blue sugar all around the shape to outline. When we removed it.....it was sooo perfect. What an amazing job by these girls. 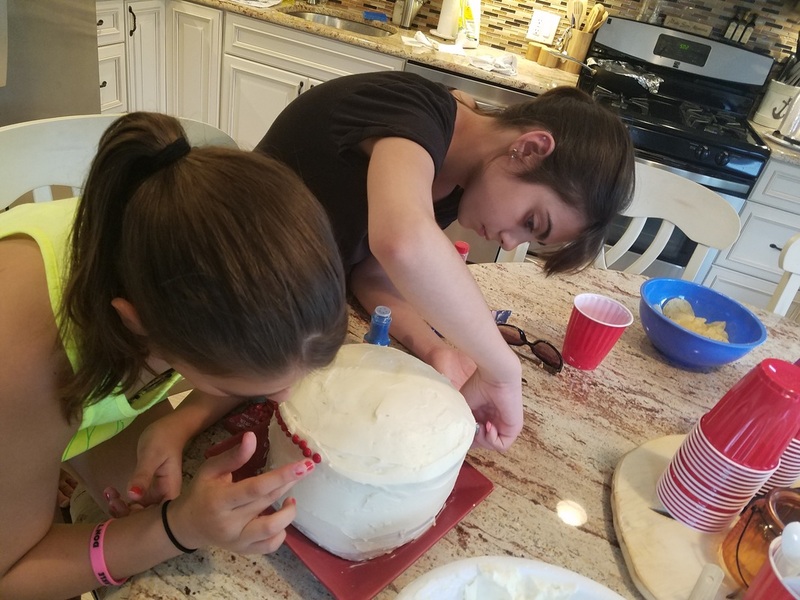 It makes me soooo happy to see kids be creative in the kitchen thinking of ideas....be comfortable enough to experiment...and making it happen. Seeing those smiles on their faces when they are happy with the results.....priceless!! And it always tastes so much better when you make it yourself!!!! Now for the big reveal.........slice into it!!! Your guests will be amazed when they see the inside of this beautiful cake!! ​Thank you to my Junior Chef's Angelina and Natalie!!! Wishing everyone a very HAPPY FOURTH OF JULY!!!! ENJOY!! !